We are a consortium of the fire service and entertainment industry acting as an ombudsman for fire service personnel, studio safety representatives, special effects operators, production representatives, venue management, and related organizations. 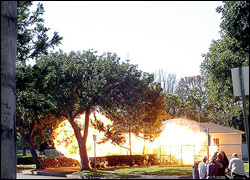 Our intent is to provide answers to the many recurring questions dealing with permit activites, special effects, fire effects, fire prevention, stunt activities and other related issues. Through education, the varied and unique challenges of filming activities can be addressed with uniformity and consistency. Motion picture, television and entertainment industry production activities can have a positive effect on a community and its economy – our goal is to further that objective. SAFFE meetings are held quarterly at various locations in the Los Angeles area – usually at one of the major studios. Discussions involve addressing old business thoroughly, discussing new business such as recent accidents, experiences, ideas, new regulations/laws, and a roundtable session updating the forum on current production activities and how members are mitigating them.